ROSIE may be the only dog to ask to come to Last Hope. Sunday Letty our dog coordinator was at Brookhaven Town Shelter to pick up 3 dogs we promised to take. 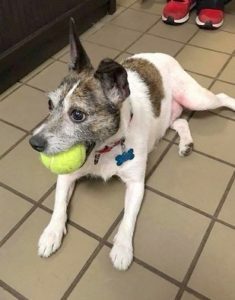 A shelter volunteer was walking ROSIE a wire-caoted Jack Russell Terrier near the front door. She is 5. ROSIE rushed up to say hello & tell Letty her tale of woe. 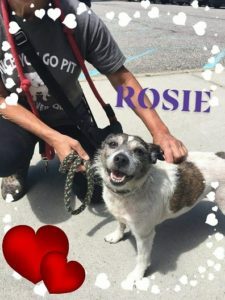 ROSIE entered the shelter as a stray. Her owners were informed she was there but they never came to claim her which meant she was up for adoption. ROSIE is so friendly & gentle Letty asked her if she’d like to move to Last Hope too. And ROSIE responded with a resounding Jack Russell “YES”. Next step is to find this cutie a forever home.